I was inspired by this grunge card here, posted in honor of Stamplorations 5th birthday celebration, and I thought this style of card would look great in today's colors. I used a variety of Stamplorations stamps listed below to make the background. I had fun and I liked it - but couldn't find anyplace that would be good for the sentiment. So I die cut the sentiment 2 times, layered them with one slightly off set to show both colors, and attached this to a strip of white cs, backed with the denim for a frame. 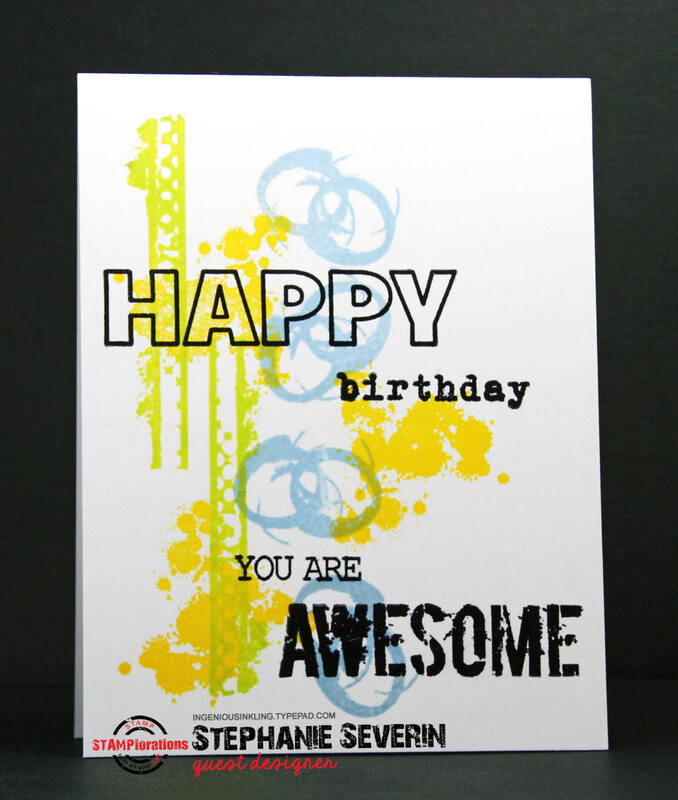 Stamped the "happy", and adhered to card front - almost a one layer card! Very cool design! This week's colors look amazing with your compilation of stamps and dies!! Very cool - love the way you made the sentiment! This would be awesome for a guy, too! This is spectacular! My fave card in the gallery. You really used these colors perfectly! Very creative background with the stamps! Like the way you layered the birthday! Beautiful card! A fabulous card. I love the back ground and the pretty colors. Wow! What a great design! Love it! I agree with you, Maura, that this style of card looks great using the color combination! I love the design! SO many interesting elements to this beauty!! I AM UBER LATE WITH MY COMMENTS THIS WEEK - IT'S BEEN ONE OF THOSE WEEKS!! !